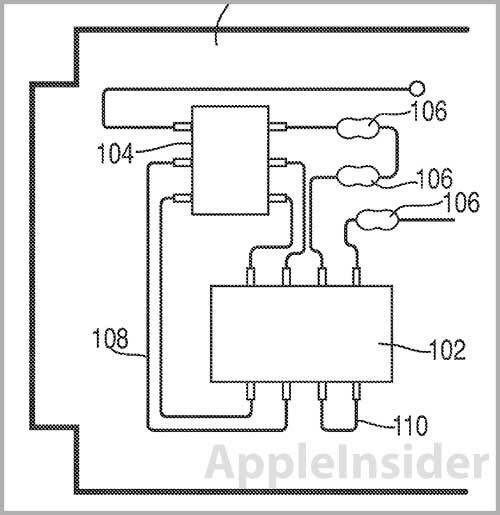 Apple's U.S. Patent No. 8,334,704 for "Systems and methods for providing a system-on-a-substrate" covers the basic functions and architecture of SoCs like those found in iPhones, iPads and iPods. Simply put, an SoC combines all circuitry integral to a computing device, such as the processor and memory, onto a single microchip. In more traditional layouts, each component is a distinct "entity" or package and is usually built on a separate microchip which is then installed onto a circuit board. With SoC technology, components can be stacked on top of each other or otherwise located on the same substrate in what is called "bare die" form. SoCs like Apple's latest A6X found in the fourth-generation iPad allow for performance in a greatly reduced space, an optimal solution for mobile devices. 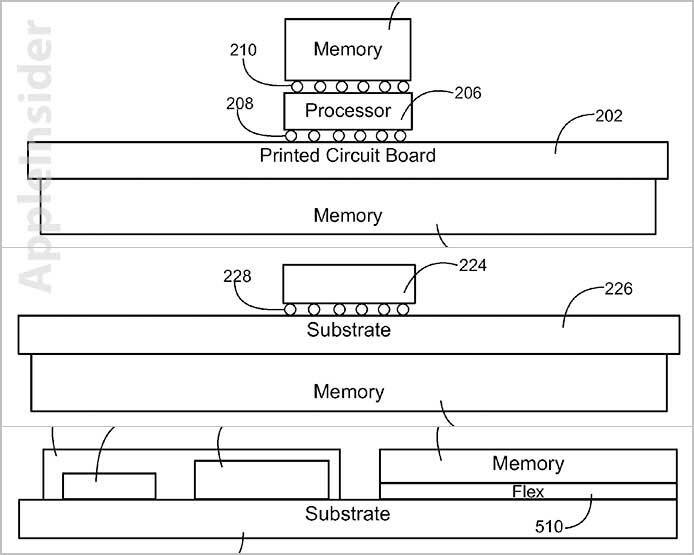 The '704 patent outlines such a system, noting that each bare die can include processors, memory, CODEC circuity, I/O controllers, communications assets, accelerometers and more. The patent language states that the components on die can go through one another in efforts to further save space. Illustrated SoC with dense component layout. Also called for is a flexible printed circuit board, called a flex, which couples to the SoC to provide further component space. For example, the flex can extend beyond the die to provide for one or more components which are attached to the SoC. For example, memory can be located above or below the substrate in various embodiments. Component (404a) coupled to SoC via flex ledge. In some configurations, the NAND flash memory used by the processing package can be located on the same side of the substrate as the integral components, such as is the case with recent A-series chips. Apple filed for the patent in September 2009, six months prior to unveiling the A4 SoC introduced in the first iPad. Most recently, the Cupertino, Calif., company released its first in-house designed package-on-package SoC with the A6 powering the iPhone 5.